Hasbro isn't the only company releasing higher-priced toys specifically commemorating live-action adaptations of comicbook heroes. Mattel is right there behind them, copying the idea. In the 1990s TV series, John Wesley Shipp portrays Barry Allen, a forensic scientist working at the police crime lab of Central City. After a chemical accident, he becomes "The Scarlet Speedster," the iconic hero, The Flash. Following the success of Tim Burton's 1989 Batman, DC was on a roll. They were, for the first time since probably the 1940s, the hottest thing around. The year before, they'd pitched a bunch of superhero TV movies to CBS, including one about the US and Russia both banning superpowers, and the Flash waking up in a future world where the villains had taken over, with him leading a small team of heroes in a revolution. That got rejected, obviously, but in early 1990 the president of CBS - no doubt inspired by all the big sacks of money WB was raking in - said he'd like to see a series based just on the Flash by himself. While the network wanted Flash to wear a plain gray sweatsuit and shoes with lights in them, the producers insisted on adapting the comic costume. Since spandex wouldn't look "real" enough in the wake of Michael Keaton's black rubber armor, they turned to visual effects artist Robert Short and Stan Winston Studios - to create the muscular look, they took a full cast of actor John Wesley Shipp's body, cast that in latex, then attached sculpted muscles to the top of that, and flocked the whole thing so it would look like cloth and not rubber. The sculpt of the toy suits that, with strongly defined anatomy that means he'll look right at home among comicbook toys, not just live-action. All the bolts are raised, sculpted elements, too. The kayfabe story behind the suit was that it was a prototype deep-sea pressure suit STAR Labs had access to - it was developed by the Soviets, which is why it was red. All the lightning bolts and such were just later add-ons to make Flash look more heroic. The red is already quite dark to begin with, and there are darker shadows airbrushed on to heighten the musculature, just like there were on the real item. The lightning bolts are gold, not yellow, but the biggest change from the comic suit is that the boots are dark red, not yellow. That's only one change, however. At the time in the comics, Wally West was the Flash, but he was still wearing the same costume he'd inherited from Barry Allen. The suit was redesigned by Dave Stevens, who changed the mask so the nose was now covered (more like Batman), and adjusted the style of the lightning on the belt and gloves. It's a good look - so good, in fact, that it was adopted into the comics a year later, becoming Wally's familiar suit. The exposed bit of jaw looks very much like Shipp, a bit better than most of Mattel's live-action likenesses. Also better? The articulation. I know, we can't believe it either. 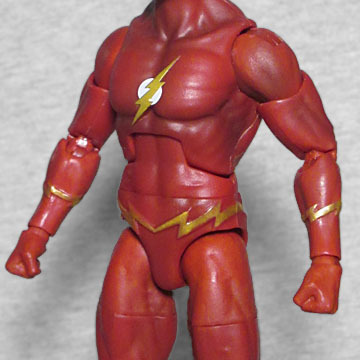 Mattel has been lazily crapping out the same articulation on its DC toys for more than a decade, but Flash moves things forward. 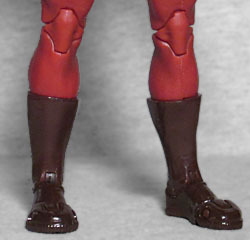 He has a balljointed head, swivel/hinge shoulders, swivel biceps, elbows that combine a plain hinge at the top of the joint with a swivel/hinge joint at the bottom, swivel/hinge wrists, hinged torso, swivel waist, balljointed hips, swivel thighs, double-hinged knees, swivel shins, hinged ankles, and hinged toes. 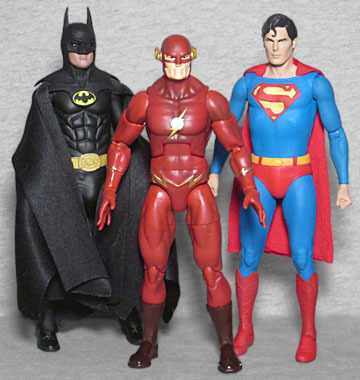 No, it's still not as good as Hasbro's Marvel Legends are, but it's a far sight better than anything we've gotten in the DCU before. You can easily put him in a really cool running pose. Or just have him flail around weirdly like Ezra Miller in Justice League. 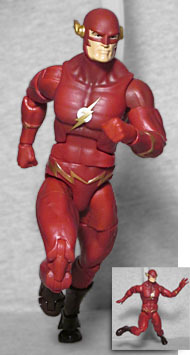 While Hasbro's Marvel Studios line ups the standard price without offering anything extra (and in fact offering less, thanks to the lack of BAF pieces), Flash comes with a plastic display base. It's 4" wide and 3¾" long, and ¾" tall, and features the DC logo on the top. Six holes in the surface allow you to plug in the included footpegs, but why bother doing that instead of just molding them on? A white plastic arm rises from the base and can plug into Flash's back for dynamic posing, or you can skip that and full the hole in the base with a flat black plug. 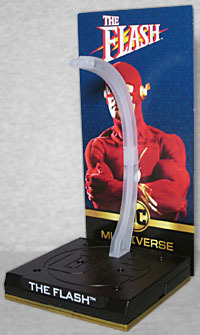 A thick cardboard backdrop can slot into the rear of the base, with one side featuring a picture of Flash, and the other just a black and gold DC Multiverse logo. The base opens up, allowing you to store all the accessories and loose pieces inside, which is just a great idea! But because Mattel just wouldn't be Mattel if they weren't messing something up, you can't use the backdrop and the display arm at the same time: the plastic sticks too far back, and thus pushes the cardboard out of the way. You could turn the arm around, but then the figure would be hovering over empty air, not standing on the base. 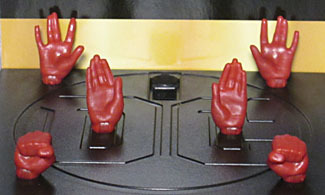 Flash doesn't use any accessories, so instead we get two extra pairs of hands. In the package he's got fists, but there are also flat "chopping" hands, and a pair with the fingers splayed. That pair was incredibly warped by the time spent in the tray, to the point where it looked like the fingers had been caught in some sort of industrial mangler. I brought some water to a rolling boil, and dropped the hands in to allow them to return to their natural shape. It took two rounds of heating to do it, but they're much better now. The Flash only lasted one season: originally, CBS scheduled it at 8pm on Thursdays, to attract a younger audience not interested in The Cosby Show. That seems like a smart move, except Fox had the same idea, and moved The Simpsons there as well. Going against the two biggest shows on TV was a no-win situation, so Flash moved to 8:30. Then CBS was airing the World Series, which pre-empted the show twice. After that, the first Gulf War started, leading to primetime news coverage. Eventually the show was moved to Wednesdays, then finally to Saturdays. Even if people wanted to watch it, they couldn't find it. When CBS ordered the producers to cut the budget if they wanted a Season 2, they opted to just end the series rather than try. It never really had a chance, and it's never seemed like somthing that would have an action figure. 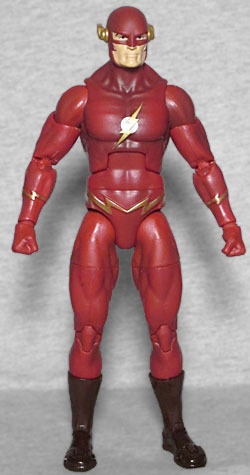 But 28 years later, thanks to Mattel, the first live-action Flash gets his due. In fact, our only real complaint is that the figure is done in scale with the comicbook toys, and thus isn't quite tall enough to fit with NECA's Batman and Superman figures.